It’s Labor Day weekend, and the eastern side of the country has been quite hot lately. Unseasonably hot for September. It makes me want ice pops (by the way, Popsicles are a brand name!). When I was young, my friends and I thought that making our own ice pops was just about the greatest thing—we would put orange juice in ice cube molds and freeze them with little toothpicks for the sticks. They were kind of bad ice pops, though, though I didn’t really care at the time. They were very hard to bite into, but it felt so cool to be eating something that I made. Why are ice popsthat you buy so much better, and how can you make better ones on your own? First, let’s discuss states of matter so that we have some frame of reference when we start. Think back to your high school chemistry class. You probably remember that there are four states—solid, liquid, gas, and plasma (which we won’t encounter with food, so I won’t be discussing it here). Ice pops involve two of those states of matter. 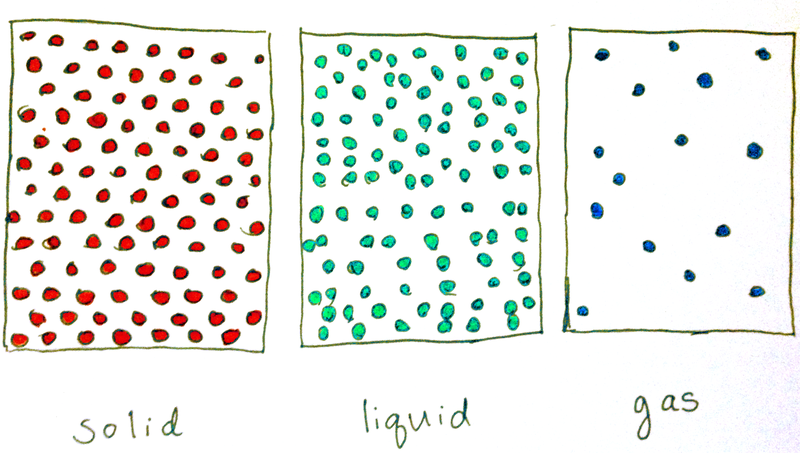 In liquids, molecules are relatively compressed but are also free to move around. There isn’t that much order in liquids. Solids, on the other hand, have the molecules much closer together and are oriented in an organized fashion such that the molecules are in a repeated pattern. 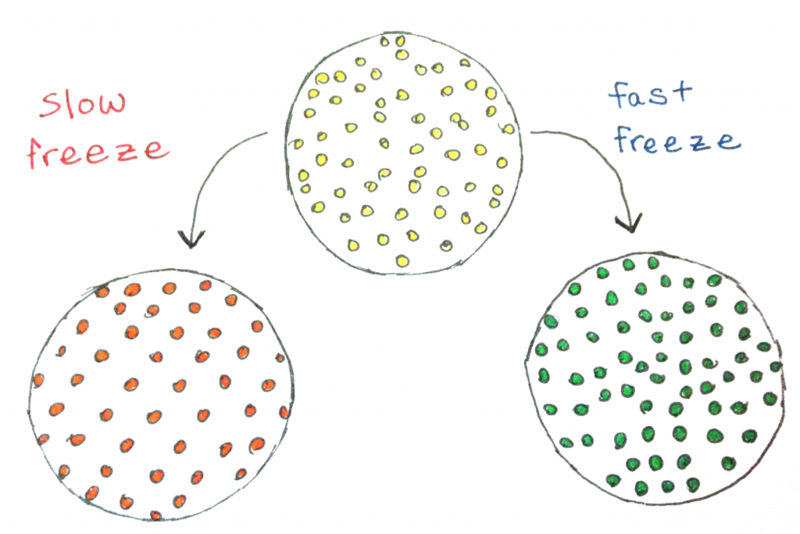 The molecules, therefore, have very little freedom to move around. When you freeze water to make ice cubes, the water is ordered like that, and it also forms large crystals. The larger the crystals are, the harder the ice is going to be to break (or to bite). When my friends and I made orange juice ice pops, it also formed these large ice crystals, making them hard to eat. Not only that, but the different areas of fruit pulp and water froze at different rates. This is because the more things that you dissolve into water, the more the freezing point is lowered: this is how salting the roads works to prevent ice formation. So, now we know that some problems with homemade ice pops are due to large ice crystal formation as well as heterogeneous ice crystal formation. How do commercial ice pop makers avoid this problem? Commercial ice pop makers also will include additives that can help with the texture of the resulting ice pop, either by affecting the rate or temperature at which the liquid freezes, or by affecting how viscous the liquid is, and therefore, how much the water can move around. Again, this relates to how easily the water molecules are able to order themselves to make large ice crystals. How can we make ours better? 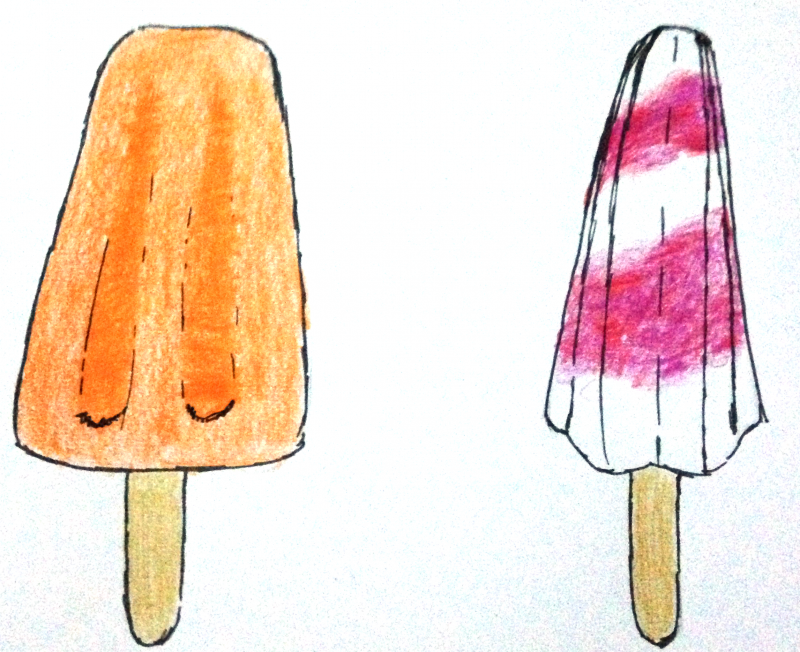 So how can we, without the fancy freezers and chemical additives, make better ice pops? We can’t really change the temperatures of our freezers, though we can affect the rate of cooling by varying the shape of the ice pop mold. You to expose as much of the ice pop liquid to the cold as possible. In other words, we want to have very little internal liquid, which will take more time to cool, and will therefore have larger crystals. (This references the surface area to volume ratio, if you are familiar with that phrase, which you want to maximize in this case.) I looked into some sample ice pop molds for which might be best, and it really just depends on the specific shape and dimensions. Generally, the more textured the pop (like the star-shaped one above), the more surface area is exposed, so it will freeze faster. Also, the thicker the mold is, the longer it will take to freeze. Finally, we can also add some other things in to our ice pops to improve their properties. Corn syrup is commonly added to commercial popsicles, and you can add it to your own, as the ratio of sugars that it possesses do a better job of lowering the freezing point. They lower it enough that crystals barely form at all. Alternatively, if corn syrup isn’t your thing, you can use other food thickeners, like gelatin (for the non-vegetarians out there), or agar, or xanthan gum. All of these will increase the viscosity of the liquid, and therefore decrease the mobility of water, again resulting in smaller crystals. Anyway, I hope this has been helpful. Keep an eye out for the ice pop recipe that I’ll post later in the week. Have a nice holiday weekend! This is a great article, and has the info I came for…except a recipe of hour to include gelatin/agar, etc. What ratio do I use?